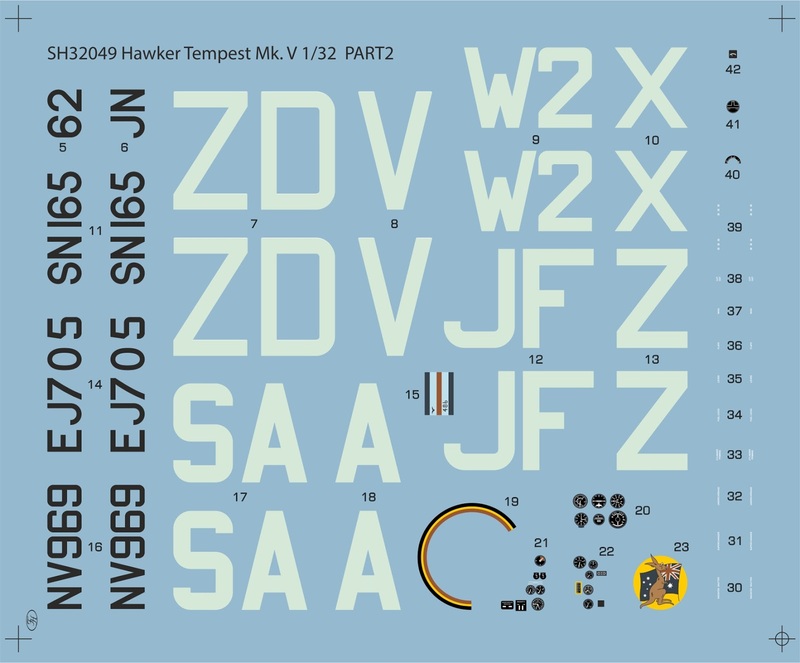 For both the 1/32 Special Hobby Tempest Mk.V models (SH32049 - standard release, SH32052 - Hi Tech release), the decal sheet artwork has already been designed. 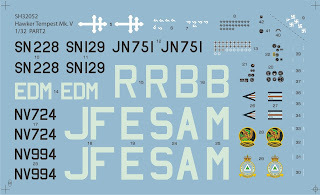 It has been broken up to several sheets, there are two sheets common to both releases, one of them with the national insignia, while the other caters for a full set of stencilling the Tempest carried both in its interior and on the exterior surface alike, and of special interest may be also the marking used on the drop fuel tank pylons. 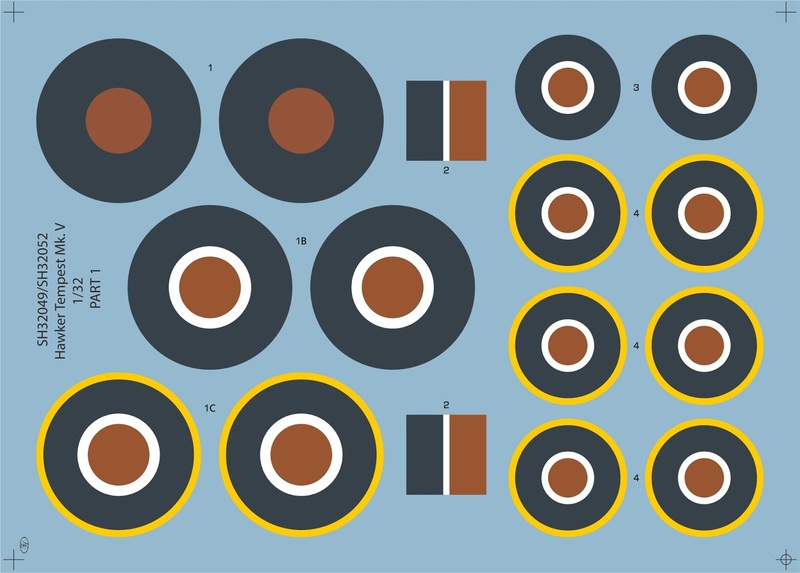 The fuselage code letters, serial numbers and other markings appropriate for each machine are offered in a sheet particular to either boxing. 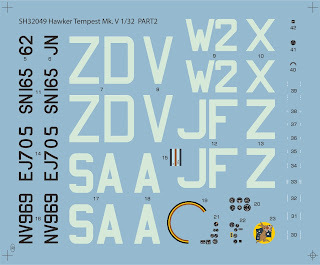 Model kit no SH32049 leaves the modeller with four decal options, the Hi Tech model no.SH32052 comes with five schemes. Hawker Tempest Mk.V, NV969/SA-A, No.486 (NZ) Sqn. RAF, Fassberg, Germany, April 1945. 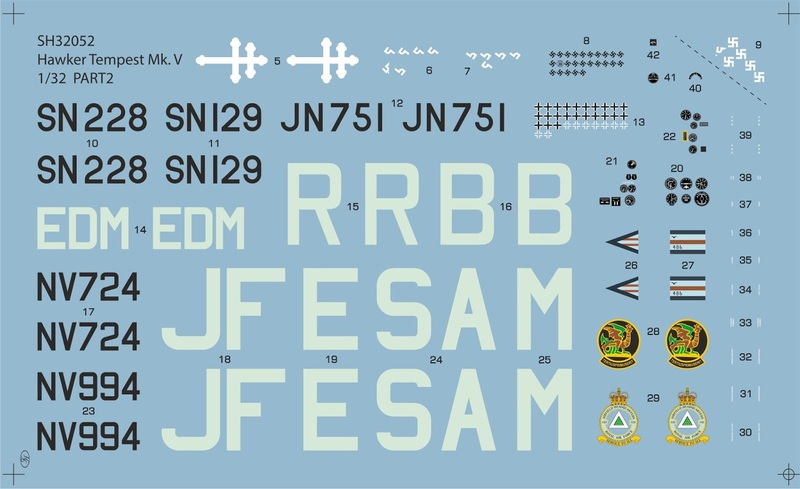 NV969 was a personal mount of the sqn CO, a New Zealandian Sqn. Ldr. Warren „Smokey“ Schrader, DFC and Bar. Hawker Tempest Mk.V, JN862/JF-Z, No.3 Sqn. RAF, Royal Air Force Station Newchurch, Kent, England, August 1944. JN862 was usualy flown by F/Lt. Remy van Lierde, DFC and Bar, a Belgian in RAF service. Hawker Tempest Mk.V, EJ705/W2-X, No.80 Sqn. RAF, base B80 Volkel, the Netherlands, winter 1944/45. Flown by Plt. Off. F.A. Lang (RAAF). Hawker Tempest Mk.V, SN165/ZD-V, No.222 Sqn. RAF, Sqn. Ldr. Emanuel Barnett Lyons, DFC, base B91 Kluis (Malden), the Netherlands, April 1945. 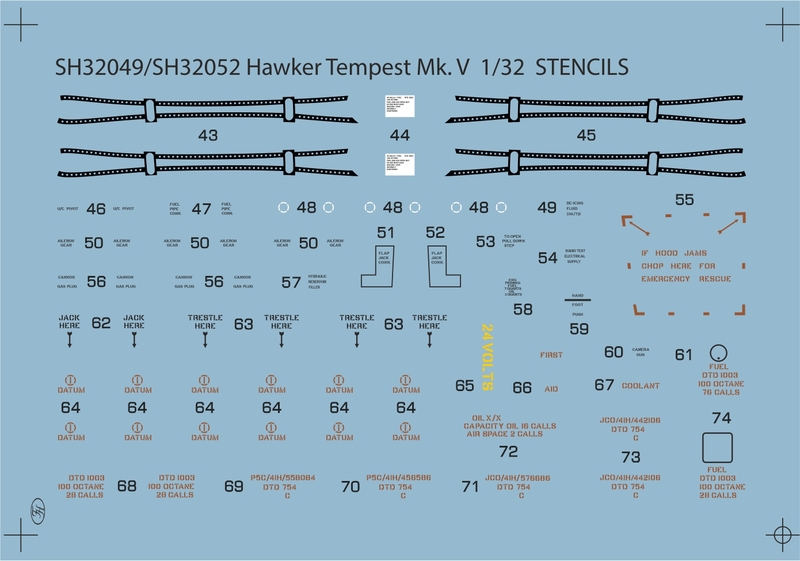 Hawker Tempest Mk.V series I, JN751/R-B, No. 150 Wing, RAF Castle Camps, April 1944. JN 751 was a personal mount of Wg. Cdr. Roland Prosper „Bee“ Beaumont, CBE, DSO&Bar, DFC&Bar. Hawker Tempest Mk.V, SN129/SA-M, No.486 (NZ) Sqn. RAF, base B152 Fassberg, Germany, May 1945. SN129 was flown by Sqn. Ldr. C.J. 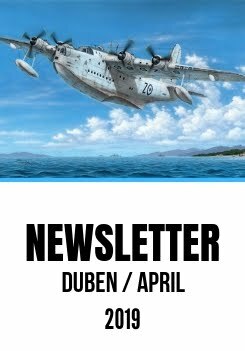 Sheddan (RNZAF). 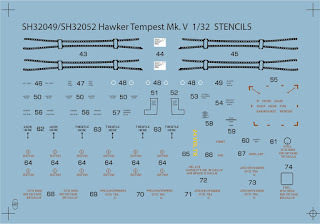 Hawker Tempest Mk.V, SN228/EDM, No. 122 Wing RAF, B152 Fassberg, Germany, May 1945. Adorned with EDM fuselage letters standing for initials of No.122 wing CO, the plane was flown by a New Zealander and a fighter ace, Wg. Cdr. Evan Dall Mackie, DSO, DFC&Bar, DFC(US). Hawker Tempest Mk.V, NV724/JF-E, No.3 Sqn. RAF, Copenhagen, Denmark, June 1945. Flown by the best of French fighter pilot aces, Pierre Clostermann. In addition to his victory markings beneath the pilots cockpit, the aircraft wore also the squadron badge on its tail fin and a Cross of Lorraine on either side of the front nose section. Hawker Tempest Mk.V, NV994/JF-E, No.3 Sqn. RAF, base Hopsten (B.112), Germany, April 1945. Flt. Lt. Pierre Clostermann achieved several victories over enemy aircraft whilst flying this very machine. Bonjour. On m'a offert la maquette du Tempest Mark V, au 1/32. Je voudrais la décorer en tant que JF°E de Clostermann. 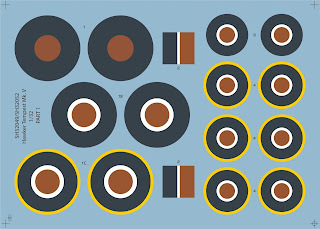 Les décalques de la boîte ne correspondent pas. Où pourrais-je la trouver?